The structures are commercial shops that constitute the main source of income for some 60 Palestinian families. The demolition took place under the pretext that they lacked the impossible to obtain Israeli issued building permits. 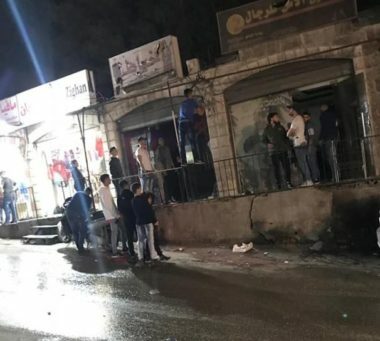 After the occupation forces notified the owners of over 20 shops yesterday of their intention to demolish, Palestinian owners evacuated their stores last night to minimise their losses. Since the beginning of 2018, the UN OCHA has documented125 Palestinian owned structures demolished in occupied East Jerusalem. AL-QUDS, PALESTINOW.COM — Palestinian Muslims on Tuesday marked the anniversary of the birth of Prophet Muhammad at the Al-Aqsa Mosque in East Jerusalem. Hundreds took part in the celebration, which was organized by Jerusalem’s Jordan-run Religious Endowments Authority. The event saw sermons delivered by Mohamed Hussein, mufti of Jerusalem; Wasif al-Bakri, supreme Sharia judge for Jerusalem; and Yasser Abu Ghazaleh, an advisor to the endowments authority. The celebration was overseen by Youssef Abu Sneineh, the imam (preacher) of the Al-Aqsa Mosque compound. Muslims around the world mark the Prophet’s birthday on the 12th day of Rabi al-Awwal, the third month on the Islamic calendar. The day is a public holiday in several Muslim-majority countries, including Pakistan, Indonesia, Malaysia, Bangladesh and Palestine and in some parts of India. Prophet Muhammad passed away at the age of 63 — on the same day as his birth — in the city of Medina in the year 632 AD. Israeli-Palestinian peace plan being prepared by US President Donald Trump is “a waste of time,” extremist Israeli Justice Minister Ayelet Shaked said on Wednesday. Speaking before hundreds of ambassadors and attaches at the Jerusalem Post Diplomats’ Conference in Jerusalem, Shaked added that the differences between Israelis and Palestinians are too great. Shaked also spoke about the demand made by her party, the Jewish Home, to appoint party leader Naftali Bennett as defence minister – an ultimatum that threatened the stability of Israeli Prime Minister Benjamin Netanyahu’s government. Earlier at the conference, Strategic Affair minister Gilad Erdan said Israel is “closer than ever” to controlling parts or all of Gaza. Erdan said that “moving from defense to offense against Hamas means targeted assassinations of leaders of Hamas’ military wing”. Jordanian authorities yesterday refused to allow a pregnant Palestinian woman to travel to the West Bank, Quds News Network reported. The woman, Yaqeen Hayek, holds a West Bank ID card but lives with her husband in Gaza. Her husband has previously been held in Israeli occupation jails and was deported from West Bank to Gaza as a condition of his release years ago. Yaqeen travelled from the Gaza Strip to Egypt and then flew to Jordan to cross into the occupied West Bank through the Allenby crossing to see her family. She last visited West Bank four years ago to give birth to her daughter. Israeli occupation forces have previously banned her from leaving the Gaza Strip for three years. Seven-months pregnant, Yaqeen was travelling with her two and four-year-old daughters when she was stopped by Jordanian authorities. Human rights NGO the Arab Federation for Human Rights said her family is calling on Jordan to stop this arbitrary procedure. Authorities gave no reason for their refusal. Israel detained 908 Palestinian children since the beginning of 2018, according to Palestinian Prisoners’ Society (PPS). PPS said in a statement yesterday that of the 908 Palestinian children detained since January to the end of October, 270 are still held in detention in various Israeli prisons. Children are usually detained in the middle of the night from their homes, they are often beaten severely and threatened in order to get them to sign confessions. Many report being denied an education, family visits and medical attention. PPS stressed Israel has enacted several laws since 2015 targeting Palestinian children in particular that would allow detention and trial of minors at age 14 years and prison sentences of more than ten years or life terms for those found to have thrown rocks at illegal settlers or occupation forces. According to prisoners’ rights group Addameer, there are 5,580 Palestinian prisoners being held in Israeli prisons, of whom 250 are child prisoners and 35 are under the age of 16 years. A Palestinian lawmaker has called on Tuesday to expel Israel from the International Federation of Journalists (IFJ) for targeting Palestinian media headquarters. “Israel has committed a crime against international laws and the Geneva Conventions by destroying the headquarters of the Al-Aqsa TV channel” Hamas’s deputy in the Gaza Strip, Ahmed Bahar told reporters in Gaza. Bahr stressed that Israel’s attempts to “silence the free voice of the resistance will fail and the Al-Aqsa channel will rise again with a louder voice to resist the occupation and expose its crimes”. The press conference was held on the rubbles of the channel’s headquarter which was destroyed by Israeli warplanes on November, 12th during a recent round of tension with the Palestinian factions in the Gaza Strip. During the conference, a local and international donation campaign was launched to rebuild the channel’s headquarters. Chairman of the channel’s board and a Hamas leader Ismail Radwan urged the international community to contribute to the reconstruction of the channel’s headquarters. This is the third time that Israel destroys the channel’s headquarters under the pretext of inciting to violence. 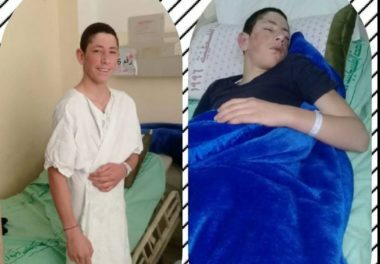 Several Israeli military jeeps invaded, on Wednesday at dawn, Beit Fajjar town, south of the West Bank city of Bethlehem, and abducted two teenage boys from their homes, including one who is recovering from surgery. 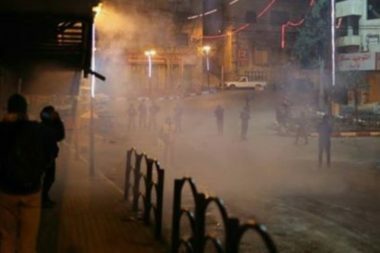 Media sources said the soldiers invaded and violently searched homes in the town, after surrounding it, and interrogated many Palestinians while inspecting their ID cards. They added that the soldiers abducted Amir Morad Taqatqa, 16, and Mohammad Adel Taqatqa, 16, and took them to the nearby Etzion military base and security center, south of Bethlehem. It is worth mentioning that Amir underwent a surgery just two days earlier, and was still recovering at home when the soldiers abducted him. Beit Fajjar has been subject to ongoing invasions, which also include the violent searches of homes, and the abduction of many young Palestinian men.